Here is the 3D project I promised to post. 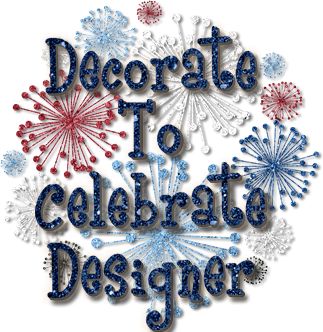 A friend of mine is moving on to a new job next week and this was a perfect project for the DT challenge over at Decorate to Celebrate. I have to find the gold coin chocolates to put in the box before I give it to her. 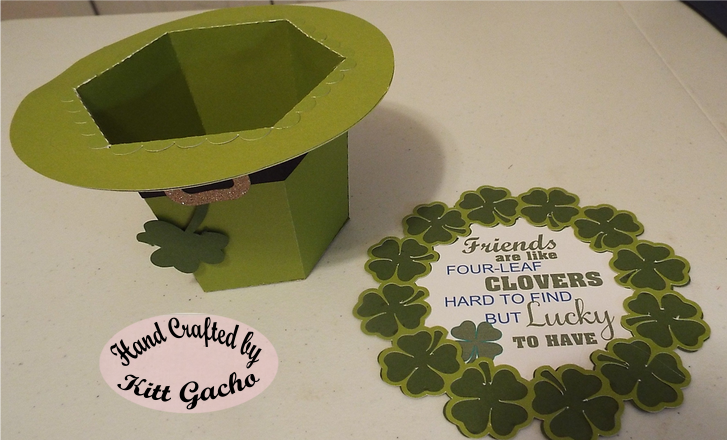 The sentiment will cover the opening of the hat and I will use a couple of glue dots to secure the candies. 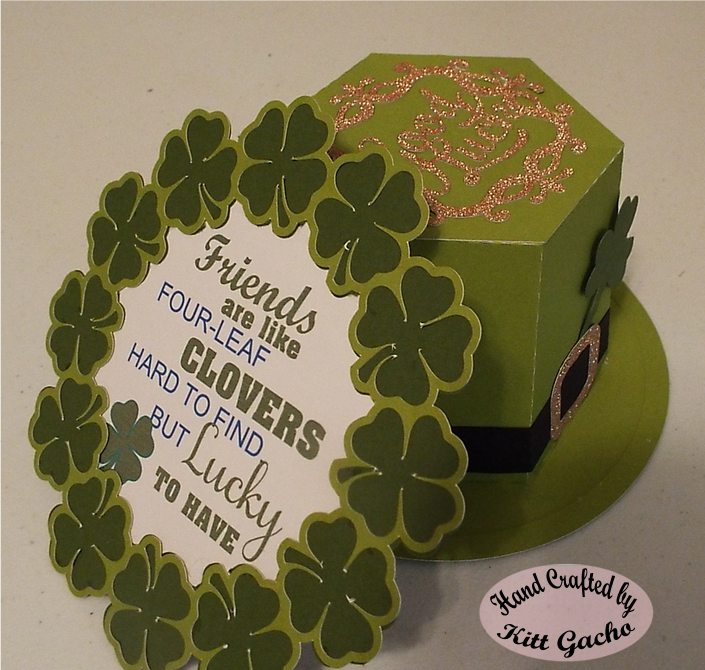 Be sure to stop by and see what the talented DT has for your St. Patrick Day inspiration. 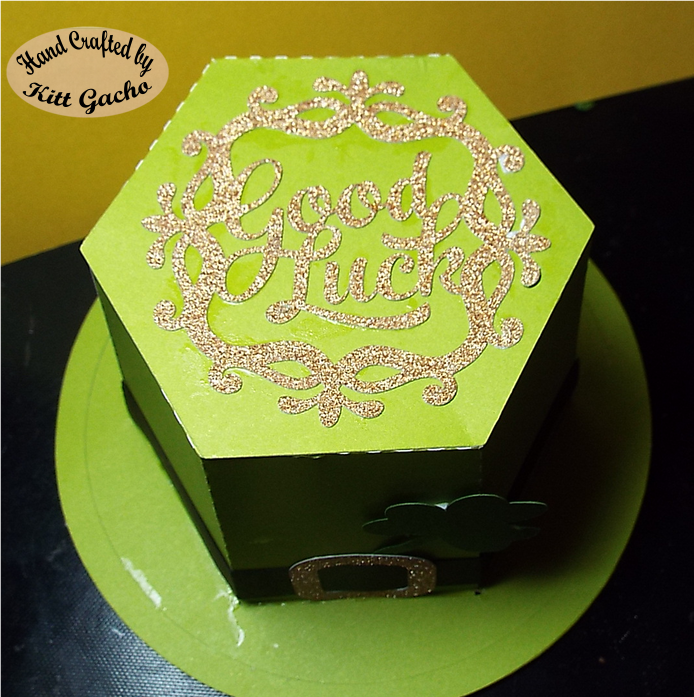 The good luck sentiment SD#67559 and treat box SD#74953 are from the Silhouette store. The clover circle is from My Scrap Chick. 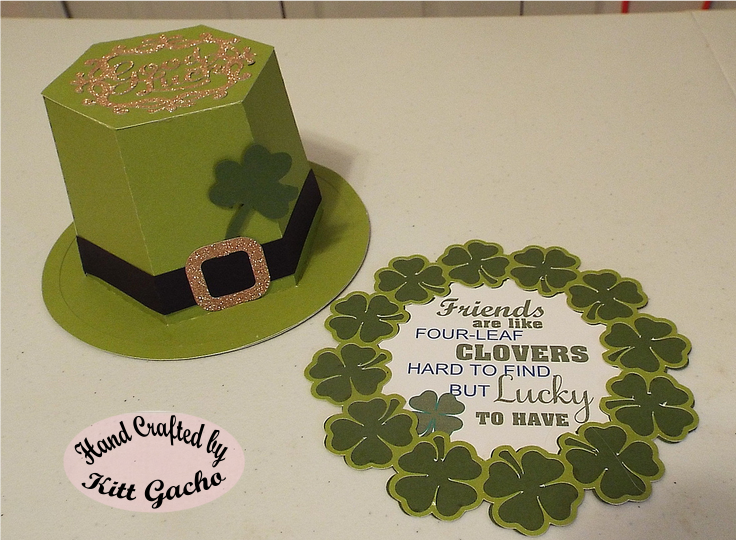 I used glitter paper for the good luck sentiment and buckle on the hat. I love your St. Patrick's day hat! What an adorable gift for your friend! This is so fun! What a cute project! Thanks for joining us over at the DoubleClick Skittles Challenge! DT Member Carri~Abusybee Skittles! Wow! This is fabulous! 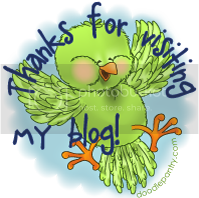 Thanks for sharing and joining us at Inspiration Destination. Hope to see you again and good luck! Stunning, thanks for sharing it with us over at Creative Moments. This is fabulous! 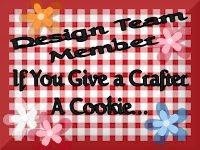 Thanks for sharing and joining us at Crafting with an Attitude. What a Fun Project! I love your hat. Thank you for playing along at TTCRD this week. Please come and join us again tomorrow for our new Anything goes challenge. TTCRD DT Deonna At ialwayslovetomakecards.blogspot.com. 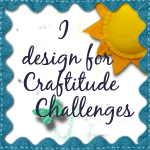 Awesome project for our GREEN challenge this week at 4 Crafty Chicks - thanks for playing!! Great project. Thank you so much for sharing it with us at Ruby's Rainbow. Wonderful, wonderful projects! Thank you for joining the DoubleClick Skittles "Use Green" Challenge! Kitt this is a wonderful creation with great attention to detail. Its so fun for St Patricks. It is perfect for our 27th ‘ANYTHING GOES’ challenge. Thanks for sharing your talent with us. Good luck.